So, in case you haven’t noticed, we here in the United States are in the midst of rather lengthy presidential election season. And even my international friends are following this election with much interest. This will be my twelfth full year teaching so the 3rd presidential election that I’ve experienced with students. And I have never seen kids so…. passionate about the two main candidates: Hillary Clinton and Donald Trump. Even last spring when it was still the primaries, my 5th graders wanted to talk about it. The emotional intensity toward these two candidates are sometimes tricky to navigate in the classroom and in your own home. If you are planning lessons or some reading around the elections and candidates this fall, here are some resources and some thoughts about how to guide those conversations which seem to be uniquely charged this election. We’ll discuss why you should consider talking about the election with children, some tips on how to make those discussions go more smoothly, and then finally some print and online resources to anchor those conversations. Why talking about the presidential election is important. First let’s talk about why discussing the presidential election is even necessary. So maybe you’re thinking – why even go there? Politics is always cited as one of those topics that you really shouldn’t bring up in polite conversation. In my view, we have an obligation as parents, teachers, and citizens to make sure our children are as informed as possible about the system of government in their country. Not only do we owe them that knowledge, but honestly it’s in our own self-interest. I don’t know about you, but I want a well-informed public in charge of the society that I’ll grow old in. One that knows at least the basics of the electoral system and has had a little experience researching candidates and examining claims made by campaigns. Also, those skills are transferable to lots of other arenas in kids’ lives way beyond what happens in school. And honestly, you can’t assume they are getting the information anywhere else. In the U.S., presidential elections are only once every 4 years so harness that excitement while you can. And boy is there excitement this year! So now for a few tips about how to handle those discussions in your class or library or even at home. Even under the best circumstances, talking politics with one person can seem like a minefield. So attempting to channel the conversation of 20+ kids with widely differing viewpoints and backgrounds can be challenging. My first suggestion is try focusing the discussion more on issues rather than personalities. So, start the conversation more broadly. For example, you might ask “What a makes a good leader?” rather than “Do you like Clinton or Trump?” so they can hopefully express views that are grounded in what they truly value and think beyond preconceived ideas. A second suggestion is to set some ground rules about how to debate a topic without getting nasty. And then, practice with a less emotional topic first, like what animal makes a good pet or best pizza toppings. A third suggestion is to include the third party candidates in your discussions so that it doesn’t turn into such an “us” vs. “them” but acknowledges other voices and viewpoints. And the fact that there is a lot less coverage of Jill Stein or Gary Johnson or the dozens of other presidential candidates is a lesson in and of itself. And a final thought – try try try not to reveal who you are voting for or telegraph that information through your tone or body language. Mainly because it doesn’t matter what WE think. It’s been said before, but it’s worth repeating – It is more important to teach children HOW to think rather than WHAT to think. Also, we should model open-mindedness and a willingness to change our point of view when we learn new information. And especially don’t bash a candidate (as much as you may need to bite your tongue). As a parent, I would be upset if a teacher was doing that in my child’s class, and I want to make sure that every kid feels welcomed in class and that we have an environment where we can examine issues and disagree without being disagreeable to each other. Because this election will end, but these children will have to work together for many more years. On to some presidential election resources for you! I am going to say up front at as far as books go – there isn’t much on the middle grade level for Donald Trump. I have been hunting and searching all summer, pestering all the librarians I know, and the only kid focused Trump book I found turned out to be a spoof book! So, I’m really glad I realized that before buying it. However, there are some workarounds for you. First, let’s talk about books. 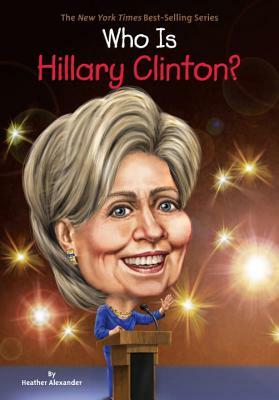 For Hillary Clinton, there is the new biography in the “Who Was” series titled Who is Hillary Clinton?. I’ll be talking more about that in our Book Talk segment later. For students wanting something more in depth, there’s a new middle grade / YA biography called Hillary Rodham Clinton: Do All the Good You Can by Cynthia Levinson. That was just released this summer. There are also a couple picture books worth checking out like Hillary Rodham Clinton: Some Girls are Born to Lead by Michelle Markel. An interesting side note about that book. Almost every single one of the 104 reviews on Amazon for that book are either 5 stars OR 1 star. Interesting. There is no middle ground there. For Donald Trump, one way to work around the lack of middle grade biographies available is to provide excerpts of the adult biographies. So there’s his famous The Art of the Deal and the newly released autobiography, Great Again, which would contain more up-to-date information for students. Obviously, you will need to read those chapters yourself first to make sure the content is okay for kids. Biographies are just one avenue for learning about elections and current candidates. Scholastic has Election Skills Books for various grade levels. And I’ve ordered the Grade 4-6 version for my class. They also have lots of activities right on their website – linked right in the show notes for you. PBS also has a really great website called Election Central 2016 with video and other resources to help you examine the elections. I did notice that the PBS website is geared for grades 6 and up. And finally, Newsela has a Students Vote 2016 Teacher Guide where you can find articles. And the great thing about Newsela is that you can adjust the reading level of the articles so everyone gets the same content but at a level comfortable for them to absorb the information. I am really excited about harnessing my students’ energy and enthusiasm this year to help us all learn something new. In this part of the show, I share with you a few books centered around a theme and discuss three things to love about each book. This week, we have three election themed books: the picture book When Penny Met Potus, the biography Who is Hillary Clinton? 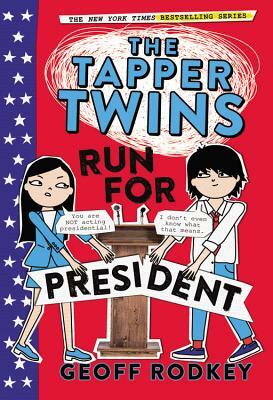 and the novel The Tapper Twins Run for President. The real-life basis of the illustrations. 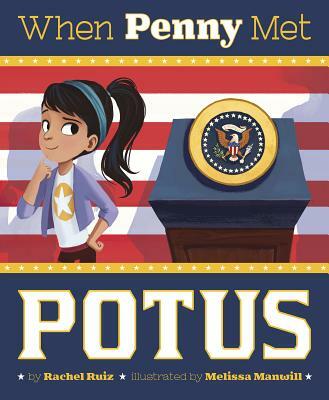 While Penny is searching in the White House, she imagines meeting POTUS in his own airplane, having a tea party together, and helping him solve the world’s problems. And in each case, the drawings are accurate. From the paint on Air Force One to the inset cabinets of the China Room where they have tea, to the famous intricate carvings of the desk in the Oval Office, it’s all authentic. The only detail I couldn’t quite confirm was the fish tank. How the author and illustrator worked together to really show you how kids can sometimes fill in the gaps of their knowledge with the most imaginative things. You and I who work with kids a lot or have children of our own, know how those misunderstandings over figurative language or in this case definitions of acronyms can lead to some pretty hilarious results. The ice cream at the end. I know it’s a small moment but I just loved that final page when Penny and POTUS are together and you catch a glimpse of this fully stocked freezer that is top to bottom packed with an awe-inspiring assortment of ice cream. I am a huge ice cream fanatic so if that’s what a White House visit is like, count me in! How the same format of this series makes them all easy to read. You already know the layout and text features before starting. As a teacher, I truly appreciate non-fiction series like that and as a reader, I feel like I can absorb more of the info since my mind isn’t working on the side to decipher the organization of the text. For example, all the chapter titles are between two thin horizontal lines. In the back, there’s always a one page vertical timeline of the person’s life right next to a one page vertical world timeline so you can place their life events in context. All of the illustrations are black and white sketches – and no photographs. It’s not too long. It’s a slim book and when you pick it up, you don’t feel like it’s going to be a major time investment. I think most children could read this book in a few hours. And if they are inspired to know even more, there’s a great bibliography in the back. Even though it’s a short biography, Who is Hillary Clinton? is packed with great information for students. I especially like the side articles about the Equal Rights Amendment, Political Parties, and previous Women Who Ran for President. So not only are we learning about Hillary Rodham Clinton, we are also getting lots of other great history as well. Side Characters: There’s Ashley, their incompetent baby-sitter who is always on her phone. Then their well-meaning but sometimes frazzled parents who send these frantic and funny text messages back and forth to each other. And my favorite – Xander Billington. As Claudia says, he’s from a “very-old, very-rich, and very brain-dead family” that came over on the Mayflower. And he talks likes he’s in a rap battle. If you ever seen the TV show Parks & Rec, just picture (and hear) Jean Ralphio. That’s Xander and he’s Reese’s running mate. It is wonderfully hilarious! You actually learn a lot about political campaigns in this book. But – not in an educational and didactic kind of way. It’s always primarily about fun. So for example, when talking about the difference between a democracy and a dictatorship, Claudia says, “Two good examples of dictatorships are North Korea and our apartment.” Reese also gets a campaign manager and tries to stay on message. The two sides work out the details of a debate – which goes horribly wrong. Claudia and Reese are each trying to get the media to write about them in a favorable way and convince voters to show up on election day. It’s really clever and well crafted. Illustrations & Drawings: This is what made me fall in love with this series – the realism and the variety of the pictures. There are screenshots of chat logs when they play MetaWorld (a Minecraft-like game where some of the events happen) and pictures of hand-drawn campaign posters. My favorite photographs though are the ones of real locations in New York City. So there is a picture of the Shake Shack and the Hot and Crusty pizza joint on 86th street where the twins have campaign meetings. Photographs of the back seats of the M79 bus and a yogurt shop called 16 Handles. This series makes me want to take a Tapper Twins inspired road trip to New York City. So if your students or children like this book, the second book, The Tapper Twins Tear Up New York is all about a scavenger hunt gone wrong through the streets of New York City. It is fabulous! So those are three different styles of book that you could include in your election themed discussions or displays in your class, home, or library. Our last segment of the show is Question & Answer time. Older kids still love them! They are great reads for smaller time slots or in between longer books. Older readers bring a more sophisticated eye that notices more than if they had read that same book even a couple years ago. In a shorter amount of time, you can expose them to a huge variety of genres, plots, characters, and themes for them to build their background and later connect those ideas to their other reading. So, definitely don’t skip the picture book section the next time you are at your library or bookstore. Okay – that wraps up our Q&A section this week. If you have a question about how to connect children between 8-12 to books they’ll love or some thoughts about why we should all still read picture books, I would really love to hear from you. You can email me at booksbetween@gmail.com or message me on Twitter/Instagram at the handle @Books_Between. Thank you so much for joining me this week. You can find a full transcript of this show, and all the other episodes, at our website – BooksBetween.com with links to every book and resource I mentioned today. And, if you have gotten some value out of this show, please tell a friend or share it on social media so others can find us as well. Thank you again and see you in two weeks! Bye! Corrina Allen is a 5th grade teacher in Central New York. She hosts Books Between, a bi-weekly podcast to help teachers, librarians, and parents connect children between 8 and 12 to books they’ll love. You can connect with Corrina on Twitter at @corrinaaallen or Instagram at @Corrina_Allen.